Location was so good. Close to shopping street and central. Pretty good breakfast. Great location close to public transport, very good breakfast, comfortable rooms very clean in the room, helpful staff. Location of the Hotel is close to train station. There is a street where all exclusive brand is located. Nice to walk alongside the street. Large room with plenty of space and a nice view. Good location, very central. Liked the cozy cafe on the ground level. Olivaer Apart Hotel am Kurfürstendamm This rating is a reflection of how the property compares to the industry standard when it comes to price, facilities and services available. It's based on a self-evaluation by the property. Use this rating to help choose your stay! One of our best sellers in Berlin! This hotel in Berlin’s Wilmersdorf district is just 650 feet from the famous Kurfürstendamm shopping avenue. The Art-Nouveau-style Olivaer Apart Hotel am Kurfürstendamm offers large rooms with a satellite TV, safe and private bathroom with shower. WiFi is available for free in the café, the lobby and in some rooms. 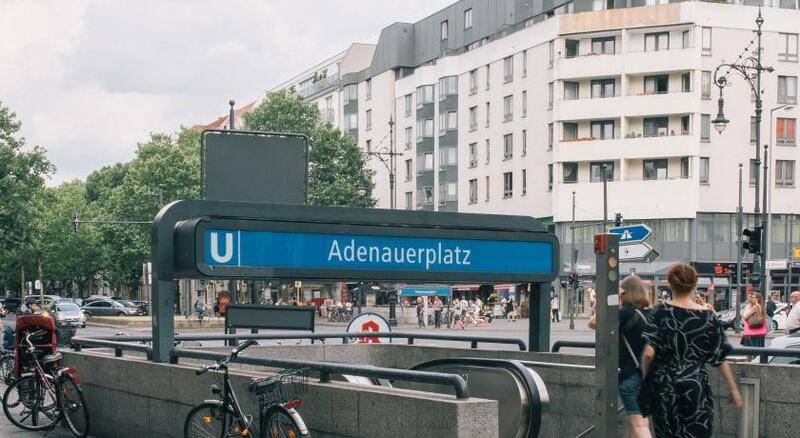 Adenauerplatz Underground Station is 1,300 feet from the Olivaer apartments, offering good public transport connections across Berlin. When would you like to stay at Olivaer Apart Hotel am Kurfürstendamm? Classic-style room featuring satellite TV, a sitting area and a private bathroom with free toiletries and a hairdryer. House Rules Olivaer Apart Hotel am Kurfürstendamm takes special requests – add in the next step! All children from 3 to 11 year are charged EUR 15 per person per night for extra beds. Olivaer Apart Hotel am Kurfürstendamm accepts these cards and reserves the right to temporarily hold an amount prior to arrival. Please inform Olivaer Apart Hotel am Kurfürstendamm of your expected arrival time in advance. You can use the Special Requests box when booking, or contact the property directly using the contact details in your confirmation. We had two rooms as we were travelling with another family. In our room, the bathroom was old and our shower had a curtain, in the other room the bathroom was brand new with a nice shower with glass doors. The room carpeting was old and worn and pretty unclean, too.The place had a very minimal lounge with no comfort and no way to spend time together sitting. The breakfast room was too small and stifling with nothing on the tables, so we had to place our plates on the wood. The girls at the reception were very kind and helpful but this was the only positive aspect of the whole thing. the location was comfortable, very near to the bus and underground stations. Is more a hotel than a aparthotel, the rooms don’t have even a mini fridge and there is no kitchen. Is more a medium hotel than a apart hotel. The room was getting warm super quickly anx the air in the room was unsupportable: there's no air-conditioning and we needed to open the window often in a middle of night. The room doesn't have ANY kitchen facilities: no posibility to make a tea/coffee or keep something in a fridge. It was very cold. For two days heaters didn't work at all. WiFi didn't had signal in our room. The toilet flushing wasn’t working when we arrived, we communicated it to the reception and the receptionist told us: we send someone tomorrow, but the next day was our check out, so at the end we didn’t use the toilet at all, we used the one in the reception. Also...they got the payment from my card before my arrive there (on booking website is: pay at the property, no prepayment needed) so when we arrived they saied “can we take that money or do you want to pay in an other way”. There were no refregirator in the room, pillow cover and quilt cover was a little bit old and ripped. Staff were very warm and friendly, also hotel's location was in the middle of Ku'damm. Price / benefit balance were perfect. The staff were very helpful and friendly. Room was big enough.